I’ll skip my European thread for a while and bring my writing close to home, in a paradise worth visiting. Situated in the heart of the Philippines is an island called Boracay which has already graced the pages of countless travel magazines. There are of course thousands of other islands in the Philippines where one can enjoy the white sand beaches without throngs of tourists but still, nothing compares to the long stretch of powder-fine, blindingly white sand that outlines the coast of Boracay. What the tropical country lacks in snow, it makes up for with endless stretches of white sand. 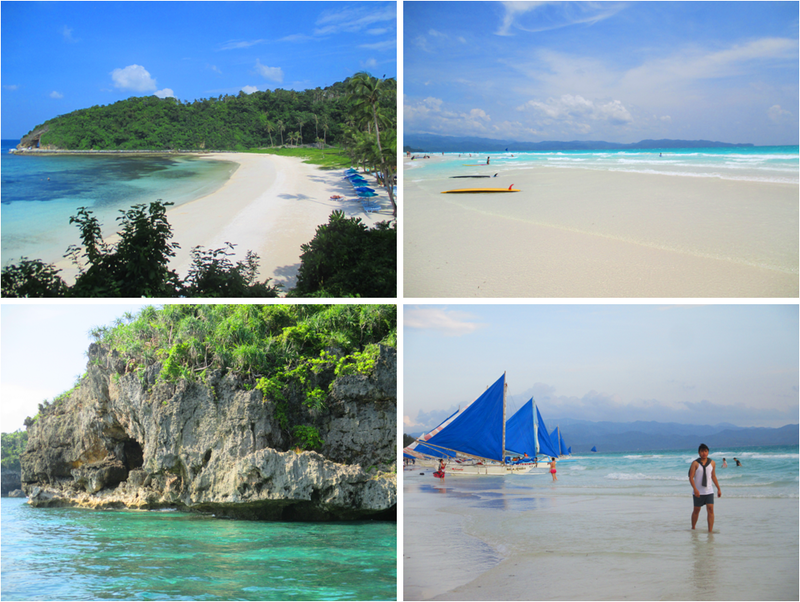 Clockwise from Top Left: A private pocket beach in Boracay far from the crowd of White Beach, the endless stretch of White Beach, blue sailboats (Paraws) dotting the coast, and a typical forested rock formation on crystal clear waters are just some of the treats that await for you in this island. It’s true that unwarranted overdevelopment is starting to endanger the island and it looks more crowded now than it was a decade ago when I last visited the place; however, the seaside is still as pristine. The turquoise and blue hues of the sea and the sky still perfectly embrace the milky white shores – the very thing that made the island top most best island lists. But if there is one thing that development has brought, it is that there are so many fun things to do now in the island ranging from water sports to night life. It is not at all too crazy and wild though. There are pocket beaches in several corners of the island to cater to those who seek peace and quiet. There are also nearby islands to hop into and spend a few moments of solitude while you try to achieve your summer tan. Nice post. I’ve read recently that boracay is still one of Conde Nast’s best Beaches/Islands in the world. Thanks. That’s good to hear. The island still has its charm. yes. Touristy or not, it’s still a beauty.